Mother Nature knew what she was doing when she covered the earth with dandelions and countless other “weeds” we keep trying to eradicate in vain. Backyard weeds, like dandelions, are some of the most nutrient-dense, medicinal foods on the planet. They’re not only essential to human health, but to the health and survival of the birds and the bees, on which human survival ultimately depends. 1. Fight cancer. A recent study found dandelion root extract can kill cancer cells, while leaving surrounding healthy cells intact. 2. Fight diabetes. Dandelion tea and juice help people with diabetes by stimulating the production of insulin from the pancreas and keeping blood sugar levels low. 3. Keep bones strong. Dandelions are loaded with bone strengthening nutrients such as calcium, magnesium, Vitamin D and Vitamin K.
4. Nature’s perfect skincare. The milky white substance that you get on your fingers when you break a dandelion stem is actually great for your skin! It is highly alkaline and has germicidal and fungicidal properties. You can use it to relieve itching or irritation from eczema, ringworm, psoriasis and other skin infections. Here’s a recipe for dandelion-coconut-oil skin cream. 5. Pain reliever. Here’s a recipe for dandelion oil, which does wonders for sore muscles and aching joints. 6. Better for your eyes than carrots. Loaded with Vitamin A and more beta carotene than carrots, dandelions help maintain good eyesight. 7. Ease digestion. Dandelion can stimulate the appetite and settle the stomach, while the root of the plant can act as a mild laxative, according to the University of Maryland Medical Center. 8. Cleanse the liver. 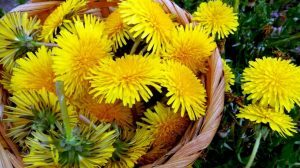 The vitamins and nutrients present in dandelions help cleanse our livers, which filters and detoxifies our blood, breaks down fats and amino acids, and regulates cholesterol. 10. Wart removal. Apply the white sap that comes out of the stem directly to wart several times per day until it disappears. 11. Save the bees. As bee colonies collapse around the world, and as humans are utterly dependent on bees for our own survival, let’s try not to destroy one of their staple food sources. 12. Feed your chickens. Dandelions also make a nutrient-dense snack for chickens. They will help keep your flock healthy and give you more nutritious eggs. 13. Fantastic fertilizer. Here’s how to turn dandelions and other “weeds” into amazing liquid fertilizer to super-charge your vegetable or flower garden with nitrogen, phosphorus, potassium, magnesium, boron, copper, manganese, sulfur, iron and silicon. Or just trim the tops of the plants and scatter them around your garden. 14. Cover crop. Dandelions make an excellent cover crop. While most people think they compete with other food crops for soil nutrients, they actually make more nutrients available in the soil, while their roots hold soil together and protect against erosion during harvest season. One study found planting dandelions among corn significantly increased corn yield. 15. Natural yellow dye. Save your skin and the environment from harsh chemical dyes, by making natural yellow dye from dandelions. Here’s how. 16. Crowns and necklaces. 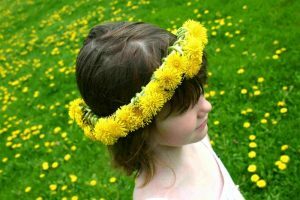 No childhood is complete without making dandelion crowns and necklaces! There are a million delicious ways to add dandelions into your diet. Throw them into a smoothie, toss them into a salad, pound them into a pesto, or make them into a refreshing iced-lime-dandelion tea. Dandelions are useful European weeds, but we have our own American weeds which are preferable to our native wildlife. 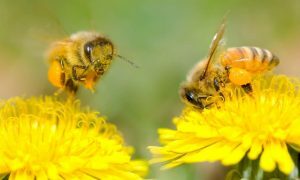 Honeybees, which are European, like most any plant, but our native bees want the plants they evolved with. Many of our native insects and birds are specialists. They don’t consider foreign plants food at all. Curious why you think everything is European … Does that mean that you think that EVERYTHING is native to Europe ??? what the hell are you trying to say here ? Our bees in Arkansas love dandelion. It’s their first stop in spring. What does that reply even mean? Medicine,food,garden booster. What a wonderful weed God gave us. I love eating the tops as a deep fried treat. Pick tops (no fertilizer area) rinse in a strainer and allow water to drop off. Make your vegetable batter (just as you would make for other veggies) however, add a pinch of brown sugar to your batter. Fry them in hot oil, drain, then eat. ****dandelions are so vitamin rich than each person should only eat an amount equal in size to their fist because there is so much vitamins A. They look wonderful on the plate and taste great. Thanks for your input. I was in Cape Cod yesterday. I picked Dandelions in the hopes of finding a way to drink or eat them. Most recipes on the net required Dandelion Root. Hallucinogenic. Dry up and smoke for that out-of-this-world experience! Can we pick dandelions and eat the flowers? They are a favourite food of tortoises too. You can pick the flowers and make them into jelly like you would crabapples and such. The leaves can be used in salads and the roots can be brewed into tea and make medicinal things with the roots. The white liquid that comes from the stems can be put on warts or eczema. I just made about 2 dozen dandelion jelly. I’m going to be drying out the roots to store for later times. To dry them they must be put in a paper bag and left on the counter in the shade and shake the bag everytime you walk by. Then when they are completely dry store them in canning jars just as they are-but they MUST be completely dry. The carrot is good for your eyes is a myth. No they’re good for your eyes the myth is they can make your vision/night vision better. I’m surprised there are no dandelion farms. There are a number of so-called weeds that are good nutritionally. It’s a whole undertapped market. As a child, we always raised rabbits. dandelions are all that we fed them. When fall came and no dandelions, everything was butchered or sold. My dad would never buy feed.